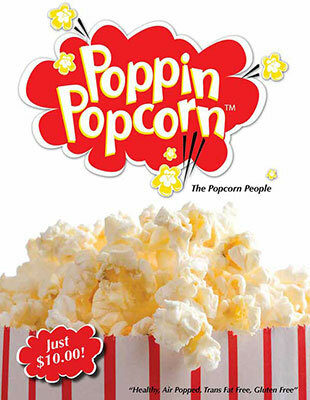 All popcorn for $10 each! A rich and buttery classic that is a favorite for many! Our signature blend of kernels, mixed with our secret blend of gourmet cheeses! This popcorn flavor will be your new go to snack. Our secret is lots of farm fresh butter, brown sugar and of course real cinnamon! Popcorn and butter were made for each other. The toasty taste of corn complements the rich creaminess of butter, and a touch of salt develops both avors. Double yum! Gluten Free. A delicious American tradition for 200 years. Leaving your mouth in a state of complete and utter elation. A delicious mixture of sweet and salty! A delicious popcorn with a kick of the southwest!